Rory McIlroy and Tommy Fleetwood trail leader Jon Rahm by one shot going into the final round of the Players Championship at Sawgrass. Northern Ireland's McIlroy and England's Fleetwood recovered from poor starts to their third rounds to shoot two-under-par 70s and stand 14 under. Spaniard Rahm had four birdies and an eagle on the back nine in his 64. Jason Day (68) is 12 under, Abraham Ancer (70) 11 under and world number one Dustin Johnson (69) 10 under. Johnson is joined on 10 under by fellow Americans Ollie Schniederjans (65), Brandt Snedeker (65), Keegan Bradley (68), Brian Harman (71) and Jim Furyk (71). 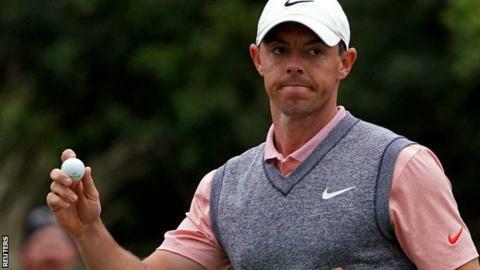 McIlroy is seeking his first tournament victory in more than a year, while Fleetwood is yet to win in the United States. Fleetwood told Sky Sports: "I hit some dreadful shots early on and made an absolute hash of the first hole after a good tee shot. That was followed by poor shots on four and into six and seven. McIlroy, 29, told NBC Sports: "To turn under par was a good effort after two early bogeys. "Once I got back to level par I felt like I had settled into the ground. I didn't drive well and I'm going to work on that now on the range." After a cloudy and cool Saturday, rain and strong winds are forecast for the final round in Florida. World number six McIlroy and Fleetwood, ranked 13th, were joint leaders by three shots on 12 under going into the third round but quickly eroded their advantage with poor starts. The Northern Irishman went right off the tee at the par-four first and a fluffed chip with his third from off the green led to a bogey. Fleetwood, 28, found the fairway off the tee but an errant second and three-putt led to a double-bogey six. Another bogey followed for McIlroy at the par-five second as he dropped to 10 under but he quickly got back on track with a two at the par-three third. Further birdies followed at the seventh and eighth as he moved to 13 under at the turn. Eight pars and a solitary birdie at the 11th on the back nine demonstrated the consistency that has brought McIlroy five top-six finishes in his five PGA Tour events so far this season. Playing partner Fleetwood birdied the second after his opening six but went on to bogey the fourth and seventh to fall to nine under. Third rounds have been problematic for Fleetwood - he shot 76 on Saturday last week in Bay Hill having shared the second-round lead, while his third-round stroke average on the PGA Tour is five shots worse than his second-round average. It looked like it was going to get away from him again here but a birdie from 28 feet on the eighth and an eight-foot putt for par on the 10th helped him regain some rhythm. He then picked up further shots at the 11th, 12th, 16th and 17th, where his tee shot finished just two feet from the flag on the famous island green. "On 10 I holed a massive par putt which was big and I got something going," Fleetwood added. "I'm just happy to get that round done. I've got a chance now and I can get up tomorrow and try to find that rhythm that I've had for two days." Rahm, 24, has been one of the most consistent players in the world in the past two years, winning twice on the PGA Tour and three times on the European Tour, as well finishing fourth in last year's Masters and tied fourth in the PGA Championship. He made a dramatic move up the leaderboard at Sawgrass having been eight under on the ninth tee. A birdie on the par five was followed by another on the 10th and an eagle on par-five 11th, which took him above McIlroy and into the lead for the first time. He went on to birdie the 13th, 16th and 17th, where, like Fleetwood, his tee shot landed just two feet away. His 64 was the lowest round of the day. Elsewhere, world number two Justin Rose birdied the final three holes to stand eight under, alongside fellow Englishman Eddie Pepperell with both men shooting 68. Ian Poulter, who started the day three shots behind McIlroy and Fleetwood, slipped back after a 75 that featured a triple bogey on the fourth, where he chipped into the water. Tiger Woods had three bogeys on the front nine and three birdies coming home in a 72 that left him where he started on three under.